So the man has finally gotten around to writing about himself in prose, and you’re thinking of grabbing this, the first fruit. A few remarks are in order, then, to help you decide whether to shell out the bucks. First I want to banish some possible misconceptions (ones I had and you very well might share); then I’ll take a longer view of the book and tell you why I think it’s worth five stars. First, it’s not an autobiography in the usual sense of the word. Sure, Bob is writing about himself and what he’s done, but time flows freely forward and back and the subject changes (sometimes radically) every few paragraphs. He doesn’t indulge in much self-justification, he doesn’t try to chart a distinct arc of personal development, and it’s not rare for him to start down a detour that screams for more exploration and then to turn the bus around. The comparison to X-Ray, the autobiography of Ray Davies of the Kinks, isn’t entirely justified — I don’t think Dylan fictionalized much — but Chronicles is closer in spirit to that than to more conventional rock autobiographies. Second, Dylan lets you into his mind but he doesn’t much open his heart. Suze Rotolo is the subject of some lyrical reminiscence, for instance, but their relationship is kept very abstract — maybe he’s protecting her privacy, I don’t know. He talks about his love for his wife and kids at length in the “New Morning” chapter, but they never even show up as characters! His second (?) wife does show up in the “Oh Mercy” chapter, but she remains nameless and faceless. The only emotions Bob really describes are awe for his idols in his early days and frustration and loathing for himself in the “Oh Mercy” period. Third, and finally, don’t overestimate how much ground it covers. At 293 pages, the book is short; the font and the large amount of whitespace padding make 293 pages sound longer than it is. I read the book in just about five hours of reading, and much of that time my pace was leisurely. The content is pretty rigidly circumscribed, too: the first, second, and last chapters cover his early life and career, in Minnesota and in New York (1949-62); the third and fourth his “New Morning” (1969-70) and “Oh Mercy” (1988-89) periods, respectively. There’s only a handful of anecdotes that fall outside those ranges. 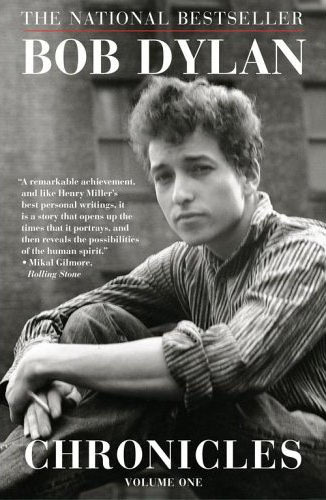 One brief, nitpicky comment before I praise the book: Dylan needed a better proofreader than he got. I know he missed at least one deadline with the manuscript and probably more, and so publication was likely something of a rush-job, but he has a tendency to use words whose meanings elude him (“incredulously” instead of “incredibly” — facts don’t tend to be credulous), and a sharp set of eyes should have caught them in a once-over. The grammar, on the other hand, is better than some have given him credit for. On the other hand, I wouldn’t be surprised if awe of the man stood in the way of proper proofing. Anyhow, my three corrections to misconceptions could be taken as negatives. If it’s got these problems, you might say, why is it worth five stars? My answer to that is that the man has a way with words, and just ’cause he won’t be tamed by chronology & word choice & all that jazz doesn’t mean that his recollections aren’t delightful. The book doesn’t resemble a chronological biography so much as a Jim Jarmusch movie, a collection of short anecdotes tied together with a declarative sentence here or an interrogatory paragraph there. Dylan, who’s rapidly turning into everybody’s favorite dubious grandpa, full of funny stories and odd ways of looking at the world, sheds light on his influences, his contemporaries, and his colleagues that are alternately revealing, funny, incisive, and patronizing, but always entertaining. The anecdotal approach he’s chosen couldn’t be better suited to his personality or even his view of life (after all, Louie the King, Georgia Sam, and God shared the same song). For sheer entertainment value, Volume One of Chronicles slays the rest of the Dylan bookshelf. Postscript: there’s a six-song companion CD available for free from some retailers with two unreleased songs (“The Cuckoo” from the Gaslight and the original demo of “Dignity”) and four released tracks from “New Morning” and “Oh Mercy” (“New Morning”, “Father of Night”, “Man in the Long Black Coat”, and “Political World”). Keep your eyes out.